Commenced in the year 2011, we, Moto Drives, are a Sole Proprietorship Firm engaged in manufacturing and trading an extensive and quality tested range of Energy Efficient Induction Motor, Sewage And Sludge Pumps, Electric Pump, Brake Motors and more. These products are produced using finest quality inputs, which are sourced from the genuine and industry leading. Our range of products finds its application in varied industries. The range offered by us to our customers is created to excellence by our technological experts and is well known globally for its diverse features like sturdy built, dimensional correctness and longer service existence. We have installed machinery and knowledgeable workforce who designs our offered products to perfectly meet the wants of our customers. Our dedicated quality checkers also check the complete range on a number of parameters to ascertain that only a fault free range is offered to the clients. Thus, the low cost of products, well-organized after-sales support, speedy delivery and free of cost technical suggestions have assisted us to set up a firm reputation in the marketplace. Furthermore, our warehousing human resource makes sure that these products are stored in an appropriate manner to keep them secure from adversities. Under the control, leadership and inspiration of our marketing manager Mr. S. Panneer Selvam, we have developed proficiency in our operations. We have upgraded the class and expertise according to the marketplace requirements and global benchmarks. Our unrelenting hard work has won us adoration from all around the world as we deliver high levels of customer satisfaction. The commitment that our team has towards preparing a quality assured range of products has made it possible for us to fabricate and supply products that completely satisfy the customers. To get this commitment processed in the products that we offer, we have a hard working team working with us. The workforce that we have has been sub divided into various sections which have professionals who best know their domain and work to continuously maintain and improve the working and quality of the products. These sub divisions have procurement agents, research team, production executives, marketing professionals, quality control experts, logistics executives and sales. The team that we have working with us is self motivated and help in developing a range that is also delivered on time even if the orders are bulky and huge. We offer proper training to our professionals so that they are updated with present market trend and happenings. This perfectly trained team maximises functionality, minimizes wastages and improves the production result. Our infrastructural unit spreads across a vast area of land and is perfectly equipped with high-quality machines and tools to manufacture these products as per the industrial quality parameter. To carry out all the processes in a smooth approach we have separated our infrastructure into many units like production, quality checking, research and warehousing. These units are taken care of by our specialist professionals who have enormous understanding in their domain. 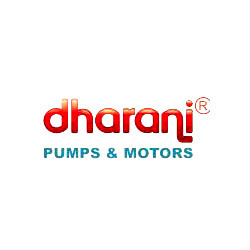 Dharani Pumps & Motors and etc. Our main aim is to provide brilliant quality products and goods to our patrons. And we are able to get this aim to practicality by procuring products from highly reliable and worthy vendors in the market. Our vendors offer high-quality materials which they create with utmost precision. We only select well recognized and knowledge holder vendors to ensure that we obtain good quality at cost effective prices. Due to this fact, we are able to offer products to our patrons in the best possible manner.